As Russia and China are increasing their economic and political influence on Africa’s economic and political development the expense of United States interests, the general tapped to head African Command told senators Tuesday. Beijing’s and Moscow’s “goals [in Africa from military aid to infrastructure investment] are to our detriment,” he said. Citing Huawei, the giant Chinese telecommunications firm promising to deliver 5G networks the length and breadth of the continent, Townsend said it was “imperative” for any regional commander to “protect our networks,” a task made increasingly difficult if a foreign power can control the flow of information. “The great bulk of our data and communications flows across what’s out there,” and increasingly it will be manufactured and controlled by Huawei. “They’re laying track all across Africa” for the communications and data flow that exists now and will only grow in the future. “China is choosing to compete in Africa and is competing hard there,” Townsend said. China is using economic incentives, through its One Belt/One Road infrastructure investment initiative, and diplomatic efforts to sway African nations away from the United States. China is also establishing a permanent naval base in Djibouti on the Horn of Africa. In Africa, Townsend said the Big Power competition “is not a primarily military approach” to gaining sway. Even so, “Russia is keen to employ a whole of government approach” from sending paramilitaries to train forces in the Central African Republic, he said. The Russians are assuming the role of national security advisor to its president and launching gold and mineral extraction ventures inside its borders. The idea in the Kremlin’s mind is to branch out from there — Mali, Niger, Chad, Burkina-Faso and Mauritania — with new training pacts and arms sales. The New York Times is reporting Kremlin interest in re-establishing its naval presence in Libyan ports and expanding existing security agreements with Sudan, Angola and Mozambique. These four countries often worked with the Soviet Union in military training, arms sales and logistics support before its collapse in the early 1990s. Four American Special Forces soldiers were killed in a 2017 ambush in Niger, which drew calls from Congress and inside the Trump administration to drawdown counterterrorism activities in Africa. However, in the wake of the ambush, the Russian military presence has become more noticeable and publicly announced, such as with the upcoming summit meeting in Moscow between Russian President Vladimir Putin and African heads of state later this year. When asked whether African nations are in danger of falling into “debt colonialism” through Beijing’s or Moscow’s predatory lending practices and losing control over infrastructure projects, Townsend said, “they probably have their eyes open” with a caveat. China, especially, and Russia “are offering a whole lot of military assistance, a whole lot of economic assistance” but “with a lot of strings attached” that might not be immediately noticeable to the recipients and borrowers, Townsend said. 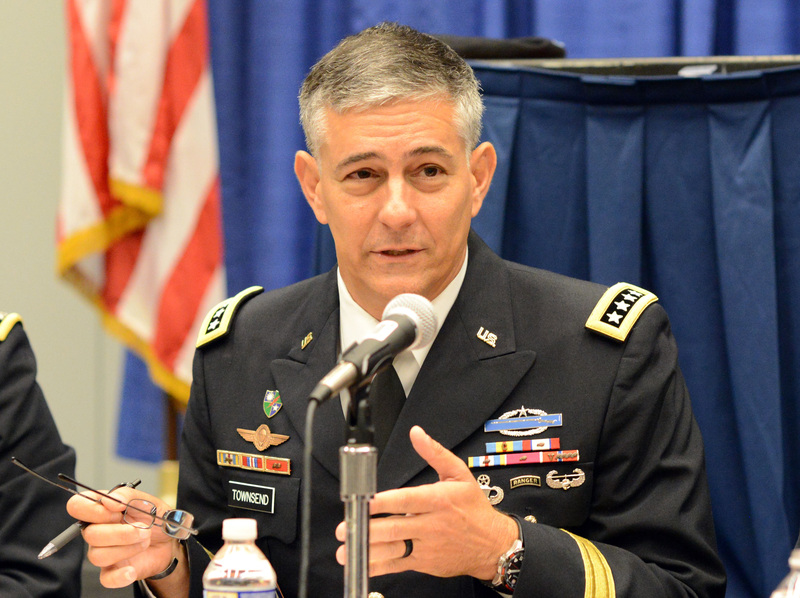 Townsend warned the committee “it’s not a binary choice” to continue funding the command’s campaign against violent terrorists and invest in programs to counter Russia’s and China’s moves to compete aggressively with the United States in Africa. “We can’t let off the pedal in [countering] these violent extremist efforts” to “keep them a local threat or a regional threat at worst” and not become the base for attacks on the U.S. homeland.